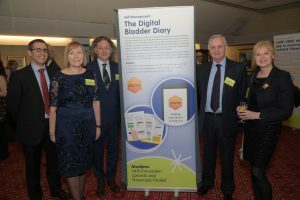 D4D joined innovative NHS staff and their collaborators from the region’s universities, charities and SMEs at the twelfth annual Medipex Innovation Awards and Showcase on 23 March 2017. Innovators from around the region gathered at Cedar Court Hotel near Wakefield for a networking event and awards ceremony where five teams were crowned winners across different innovation categories: Medical Devices and Diagnostics, GP and Community Care, Mental Health and Wellbeing, Self-Management and Service Improvement. Congratulations to all the winning innovators! You can read the full article on Medipex’s website, here.